Custom pewter kitchen sinks, such as custom pewter farmhouse sinks and custom pewter kitchen sinks, are a Handcrafted Metal specialty! For more than 25 years we have been building almost every imaginable kind of custom metal sink, including pewter sinks. We can customize every dimension and feature, including farmhouse aprons, built-in integral back splashes, drainboards, towel bars, and finishes. 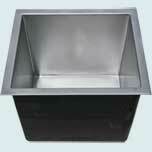 If you need a specially shaped or corner mounted sink, we can build it. Want some pizazz to really show off your kitchen? Add a fancy apron with a custom embossed design or woven pewter apron inset. If you require a very large, super deep, or especially complicated sink, Handcrafted Metal can build custom pewter sinks to your specifications that exceed your expectations. Any custom pewter sink is available with under mount, drop-in mount, or flush mount rims. Create your custom pewter farmhouse sink or custom pewter kitchen sink by combining our custom features into the perfect custom pewter sink for your kitchen. To start, select a sink style on this page, then browse our galleries, choose any of our custom pewter sinks, and click Customize to enter the dimensions you need and get an instant price. Handcrafted Pewter Farmhouse Sinks comes in various sizes and options. We can have Single Bowl, Double Bowl or more with Aprons option. Handcrafted Pewter Custom Kitchen Sinks have many options to choose from i.e Single Bowl, Double Bowls or more with drainboard options etc. Custom Pewter Bar Sinks and Custom Pewter Prep Sinks at Handcrafted Metal comes in various sizes and Shape to fit your custom requirements. Curved Apron Pewter Custom Kitchen Sinks, gives stylish a new meaning. The Solid Apron in these Pewter Sink Style gives it a powerful Presence. We offer an extensive selection of Custom Pewter Kitchen Sinks styles in every metal category. Just browse the Style to see hundreds of different custom pewter Sinks products. We are glad to answer any questions about any of our Custom Pewter Sinks. Call 1-800-755-0310 to speak with a product specialist who will help you select and configure your ideal custom pewter kitchen sink. Handcrafted Metal Custom Pewter Sinks are built in a way to be the focal point of your kitchen or Bar.